Dental implants are small posts made of titanium or a biocompatible metal and are used to secure sockets in the gums left by a missing tooth. Implants fuse to the jawbone tissue of the patient in order to become stable and painless. The jawbone starts to deteriorate when not being used to support a natural tooth. Therefore, upon losing a natural tooth, dental implants are the only restoration solution that preserves, stimulates, prevents loss of and grows the natural bone. 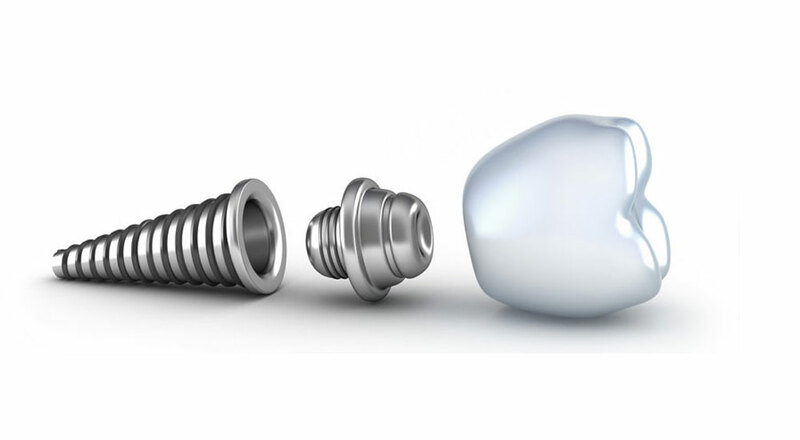 An implant can support a single crown while a series of implants can support an entire bridge or partial denture. The daily care of dental implants is very similar to the care of natural teeth. Restored dental implants should be kept clean and plaque free twice a day using a brush and floss. Cleaning is especially important after meals. This is accomplished by gently brushing, giving special attention to all sides of the implant. You must be committed not only to the daily performance of dental hygiene at home but to regular visits to our dentist (Milburn Dental Office in Fresno, CA is currently accepting new patients). It is recommended that you see our dentist every 3-6 months for a professional exam and cleaning. The implant(s) should be examined with a dental x-ray annually. Dental Implants can develop problems without consistent daily care. The earliest sign of a problem begins with the observation of bleeding. This is known as mucositis. The current scientific evidence suggests that this may be successfully treated and is reversible if caught early. Unfortunately, if it progresses to bone loss, also known as peri-implantitis, the bone loss is not reversible. If peri-implantitis is not treated it can lead to advanced bone loss and the removal of the implant. For an accurate assessment of implant health, dentists and hygienists need to probe and measure the gums around the implant the same was as around teeth, check and compare x-rays annually, look for looseness, check the bite and check all of the components that are attached to the implants to make sure that they are functioning properly. According to a 2010 ADA survey, close to a million Americans have dental implants installed in their mouths (American Dental Association. “Dental Health Services in America – University of California.” Faculty of Medicine – UCAL. N.p., June 2010. Web. 6 June 2017.). Composed of titanium or another alloy, these small but strong metal posts are inserted into the socket left by a missing tooth and act as an anchor for a replacement tooth. The main concerns with individuals suffering from missing teeth include bone loss in the jawbone and the possibility that other teeth can shift in order to fill the empty space, causing aesthetic abnormalities. An implant will stabilize the jawbone by preventing bone loss and stimulating bone growth. Your missing teeth will no longer impact how you look or feel! How Do I Know It’s Necessary? You may be in need of dental implants if you are currently missing one or more of your teeth due to injury, decay, or disease. Depending on how strong your jawbone is and how healthy your gums are, you may or may not be an optimal candidate for implants. Our Fresno Dentist will discuss the pros and cons of all your options and examine your teeth and gums. Other options include dental bridges or dentures, which can also be effective depending on your situation. If you do not have enough bone at all for an implant or if it is too weak, our Dentist in Fresno might also discuss the option of building more bone through a bone graft. Our dentist will consult with you to determine the best approach for your treatment. This will typically include a thorough oral exam, X-rays, and a few questions about your family medical history. You will then be given instructions not to take certain medications or eat certain foods before the procedure. Make sure to follow these instructions and contact your dental office if you have any questions. To allow gum tissue to heal properly, it is possible that a dental implant process might take more than one procedure to complete. Depending on the medical history and other factors, our dentist will discuss which anesthetic is best for you. Typically, a local anesthetic is used which only numbs the parts of the mouth being worked on at that time. In stage one, our dentist places the metal implant into your jawbone under the gum tissue. It needs to be inserted deep into the jawbone, as this will serve as the best anchor for your new tooth. The gums are then stitched back into place. As gum tissue heals, the implant begins to bond with the bone and attach to the gum. The entire healing process may take several months. Contact our Fresno Dentist at Milburn Dental if you are feeling anything unusual during the healing process. The placing of an abutment is also part of the procedure, but it is possible this part of the procedure might need to be done at a later time. The abutment is the piece where the replacement tooth will attach to the implant. The final stage is placing your replacement tooth or teeth. Getting to this step might require a bit more healing time because your jawbone needs to be strong enough before the new tooth is placed. Our dentist will take impressions to ensure your replacement teeth are an appropriate fit and then insert them following the exact specifications of your case. Following your successful procedure, it is normal to experience some pain, swelling, and minor bleeding and you may be prescribed pain medication and/or antibiotics to control possible infection. Our dentist will sit with you to show you proper cleaning techniques for your new teeth and give you advice on what to eat and drink in the weeks following your procedure. Initially, you might need to stick to soft foods while the implant heals. Concerned about your missing or damaged teeth and need advice? Do you want a pernament tooth replacement solution? Contact Milburn Dental today at (559) 825-0990 to schedule a consultlation with our friendly dentists! is it possible to have all your upper teeth replaced by implants? Just got my dental implants done by Dr. Bhatia and her team of dental professional in Fresno, CA. I highly recommend her if you are thinking about getting dental implants. It seriously has changed my life! Yes, Dr. Bhatia is an exceptional Dentist! I’ll be sure to pass along your message to her and her team. They will be thrilled!